Making New Out Of Old. I love to creatively paint. I am not very good at it but I have a very vivid imagination. One of the best ways for me to relax is to find an old object and make it new again. This is a bench that I repainted. I bought it at a garage sale for a dollar. It sat in my basement a long time. It was an ugly gray with paint spots on it. I love sparkles so what you maybe can’t see in the picture is the sparkle paint on the butterfly. 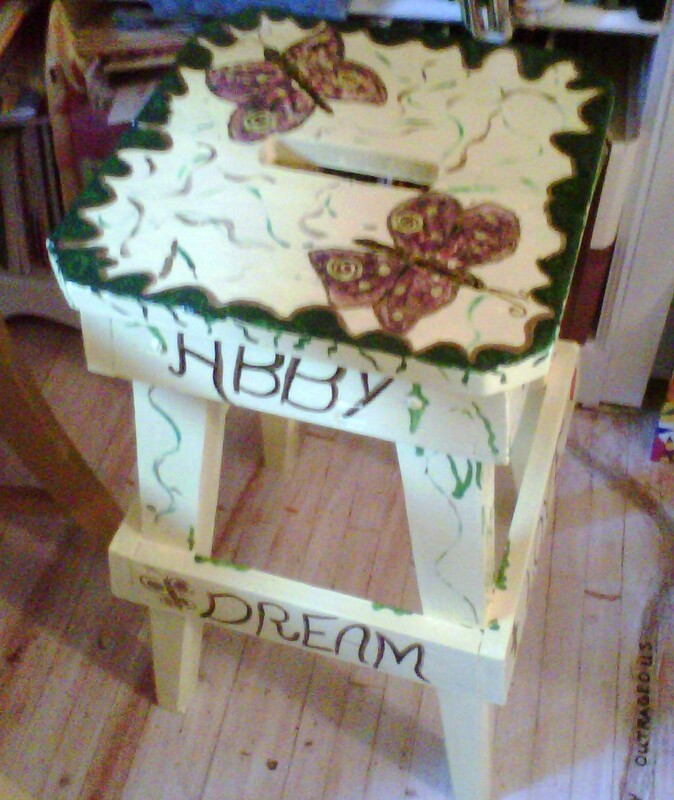 That was my ugly little stool that turned into a butterfly. First I sanded my stool. Then I did a base coat and then I painted it bright yellow. I used a shiny paint because I like shine. I never know when I start to paint what the finished product will look like. I keep painting and tweaking until I like what I did. I also used some glitter paint to add my sparklies that do not show up very well on this picture. I finished it with a couple of coats of varnish for the tough wear and tear of kids. Painting old things is a great way to use up old odds and ends of paint. It helps you declutter your paint collection too. You don’t have to be a good painter to paint. It is your creation and it doesn’t matter what others think as long you are happy with it and you can lose yourself in your creativity to relieve your stress. Paint on. Previous Creating Something Out of Nothing.